If 2016 was the year of “tough decisions”, 2017 was the year of “the slow road back”. The words in Deloitte’s outlook report for the sector, written by the company’s US Energy and Resources Leader John England, summarise the present state of the petroleum industry. England referred to the Organisation of the Petroleum Exporting Countries’ (OPEC’s) move in November 2016, when members of the cartel reached an agreement on production cuts aimed at balancing supply and demand in the oil market. It was the first time the organisation had taken such a drastic measure since the financial crisis in 2008. Since the deal took effect in January 2017, oil prices have recovered amid stronger global economic growth. However, high volatility and fluctuations have got in the way, and challenges have remained at a moment when new threats lie ahead, such as the transformation of fuel cars into electric models. While it works tirelessly addressing the current issues, the oil industry is also anticipating what is to come. 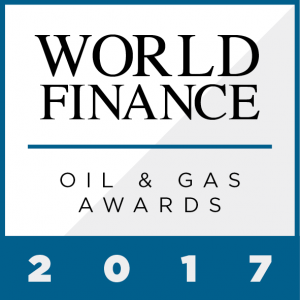 The World Finance Oil and Gas Awards 2017 recognise the prominent companies in the sector that have managed to succeed despite the challenges, and today continue to forge ahead. Oil is the world’s leading fuel. According to the latest statistical review by BP, it accounted for one third of global energy consumption in 2016, increasing its market share among other types of energy for the second year in a row. But prices have been depressed. The move by OPEC at the end of 2016, which was subscribed by a large group of non-OPEC countries shortly after and led by Russia, was a consequence of a rapid downfall in the oil market over the past few years. Producers saw prices collapse from a peak of $115 per barrel in June 2014 to around $30 in 2016. Among other reasons, the decline was due to concerns about slowing growth in China and other emerging markets. Consequently, the industry’s leaders decided to curb production to almost 1.8 million barrels a day – or around two percent of the global output – for six months. However, the measure aimed at pushing the prices up was just the beginning of a longer-lasting strategy revalidated in May 2017. In a new meeting, the oil cartel and its allies decided to extend the effort until at least the end of the first quarter of 2018. Since the output cut began, the group of 21 nations that are part of the deal haven’t been strictly successful in achieving their cut targets. According to data analysed by Bloomberg, OPEC nations only met their cutback goals in the three months from March to May 2017, while the non-OPEC countries were only effective in August and September 2017. Nevertheless, attempts to roll back an oversupplied market have impacted prices. From a market perspective, the effect has been positive, but not enough; prices have been volatile, failing to provide a significant and steady upward trend in the value of the commodity. Indeed, after the first half of 2017, prices started to show stronger figures. In December 2017, oil prices reached their highest levels in more than two years, with the price of Brent Crude – the global reference price – breaking $65 a barrel. Experts attributed the gains to current global economic growth: for the first time in a decade, economies around the world are expanding simultaneously, The Wall Street Journal reported. This comes together with stronger industrial activity demanding more diesel, an increase in international trade, and consumers being empowered by higher employment rates. As a result, oil prices are part of the virtuous circle of an increasing demand. With its members holding more than 80 percent of the world’s proven crude oil reserves, OPEC has considerable influence on the market. In the presentation of its latest World Oil Outlook in November 2017, OPEC’s Secretary General Mohmmad Sanusi Barkindo said: “The past year has been a historic one for OPEC and the global oil industry.” He recognised that, since November 2016, “it has been a period when the rebalancing of the global oil market has gathered vital momentum”. Looking ahead, OPEC is cautious. According to the group, global demand for oil won’t peak in the period to 2040, but growth will soon decelerate. In line with these expectations, the largest companies in the sector predict demand will hit a peak and decline in the years ahead because of new technologies and electric vehicles. For example, Royal Dutch Shell and Norway’s Statoil forecast the highest point of demand will be reached between 2025 and 2030. In regards to where the demand will be originated, both OPEC and the IEA expect driving forces to come from emerging economies. Among those, the IEA’s outlook named one of the world’s fastest-growing economies: “India, particularly, is gradually becoming the focus of attention as Chinese demand growth slows. Twenty years of strong demand growth in China, fuelled by rapid industrialisation and infrastructure spending, is giving way to a slower pace as the Chinese economy moves towards a services and consumer-led structure,” the report explained. In numbers, even though Indian per capita oil consumption represents less than half that of the Chinese, at 1.2 barrels per year, the IEA focused on the potential: “There is clearly still plenty of growth to come from India.” In the next five years, the country’s per capita oil consumption is expected to reach 1.5 barrels. Compared with coal and oil, natural gas is a less harmful fuel. Under the analysis of the IEA, the gas market is transforming from a regional to a globalised system, with increasingly interdependent markets. At present, the main drivers are “the availability of shale gas and the rising supplies of liquefied natural gas”, the IEA said. The IEA’s latest forecast on natural gas predicts that global demand will grow by 1.6 percent a year for the next five years, with consumption reaching around four trillion cubic metres. According to the predictions, China will be the main driver on the demand side, while the US will provide most of the additional supply thanks to the sharp growth in its domestic shale industry. Despite the ongoing clean energy revolution, forecasts on fossil fuels are still upbeat about the near future for oil and gas. Now, with the tail wind of global economic growth, both seem to have an opportunity to gain further momentum, especially those at the forefront. These leading figures can be found among the winners of the World Finance Oil and Gas Awards 2017.